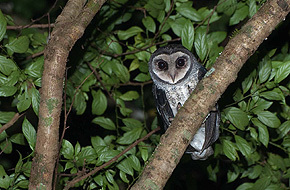 Here’s a photo of the beautiful Lesser Sooty Owl, the one who has been frequenting our new fenceposts. He was spotted 4 times last week! Unfortunately we can’t lay claim to this photo but if he keeps his visits up we might just snap a good shot of him to share. Sweetwater Lodge in Julatten is a fabulous property for bird-watching, with 4 major bird habitats drawing in numerous species to our 160 acre natural paradise.